The Ultra Mirage™ II combines the best features of the Ultra Mirage™ mask and other popular ResMed nasal masks, offering a unique combination of comfort, convenience, quietness, and effectiveness. The Ultra Mirage™ II combines the best features of the Ultra Mirage™ mask and other popular ResMed nasal masks, offering a unique combination of comfort, convenience, quietness, and effectiveness. Millions of sleep apnea patients have benefited from the superior comfort and seal of ResMed's Ultra Mirage™ Nasal Mask. 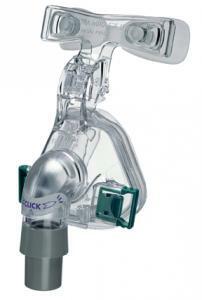 Now there is an even better mask available - the Ultra Mirage™ II Nasal Mask. The Ultra Mirage™ II is similar in shape and design to the original Ultra Mirage, and offers the same high performance and quality with even more features.